What do eggs, avocados, and olive oil have in common? Sure, they all taste great in a salad but they can also give you strong, lustrous hair when used in a DIY hair mask! Hair masks are a great way to naturally heal, strengthen, and beautify hair. From the Berber women, of the North African desert, who learned the secrets of argan oil for supple skin and hair, to the tropical South Pacific where women used coconut oil and flower extracts to keep their hair silky and soft, women across the world have been making their own hair care products for centuries. Now, modern women are discovering the benefits of these natural, chemical-free ingredients for all hair types and problems. It is important to consider what your are using on your hair between your natural mask. Look for hair care products that use natural ingredients and are free of sulfates, parabens, and silicons, try HAIRFINITY Haircare. You wouldn’t want to nourish your hair and later strip it with harsh shampoos and conditioners. Whether you want to avoid toxins or save money, here are some recipes to get you started on a hair mask DIY project. Does your wild, dull, frizzy hair drive you crazy? ! Whether you constantly struggle to tame frizz or if it only occurs now and then,the problem is a lack of moisture. The layers of cuticles on your hair need moisture in order to make them smooth. You don’t have to simply accept your frizzy fate. Say hello to avocado, your new best frizz-fighting friend. Supercharged with vitamins A, D, E and B6, avocado is also high in proteins, amino acids, magnesium, folic acid, copper and iron. 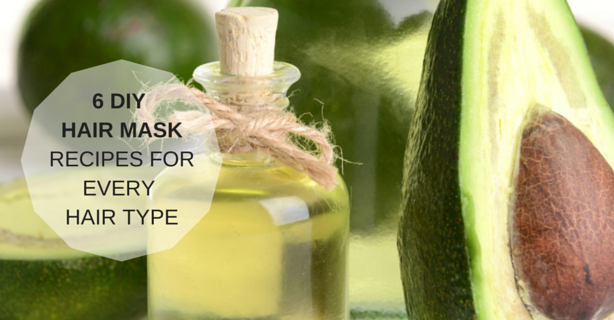 The oils in avocados are one of the few that can penetrate the cuticle and actually moisturize hair. Combine avocado with coconut and olive oil—two other powerful frizz-fighters—and you have the perfect hair mask for dry frizzy hair. Puree 1/2 a ripe avocado in a blender until smooth. Stir in coconut milk and olive oil and mix well. Apply the mixture onto your scalp going downwards to your hair ends. Take time to massage the hair mask in gentle circular motions deep into your scalp. Wait for 15 minutes before rinsing off the mask thoroughly. Shampoo and condition hair as normal. While frizzy haired people battle to keep their tresses under control, those of us with fine hair struggle to pump some life into limp locks. Though fine hair is largely genetic, hair can become thin for a variety causes including medical stress, over styling and chemical processes. For suddenly thinning hair, you should talk to your doctor but there are also natural ways to boost lifeless hair. You’ll go bananas over the potassium in this super fruit, and it’s great for strengthening and thickening fine hair. Bananas nourish the scalp and hair follicles, help maintain natural hair elasticity, and prevent breakage and split ends. Honey,a natural humectant,will add moisture and shine to even the dullest head of hair. Mash the banana(s) in a bowl until smooth, then add the honey to your mashed bananas. Apply the mixture to dry or slightly damp hair. Cover with a shower cap, towel or saran wrap and wait 20-30 minutes. No matter what the cause, oily hair is a result of the overproduction of sebum, a waxy type of substance naturally occurring in the body. Normal levels of sebum keep hair supple, soft and waterproof but too much will leave hair greasy and limp. Once more, genetics can play a role but other factors can lead to oily hair. Use of improper hair products, lack of regular cleansing, hair products with excess chemicals, perspiration, smoke-filled environments, and hormonal changes can all make oily hair more pronounced. In our fast-paced, demanding lives, is it any wonder that our hair suffers from the side effects of the same stress the rest of our body goes through? The list of causes for dry or damaged hair is practically endless. Strands of healthy hair have a protective layer called a cuticle. The cuticle acts as a protective shield, guarding your hair against heat damage. If you looked at a healthy cuticle under a microscope, you’d see the layers lying tightly together, sealing in moisture. In an unhealthy cuticle, the layers are separated and the moisture, along with some oil, can escape. Even as we try to create beautiful hair, we may be damaging our cuticles. Over-washing your hair with a harsh shampoo can strip the natural oils from your hair. Blow dryers, curling irons, flat irons and other hot styling products can also rob hair of moisture, as can alcohol-based styling products—the two together can be especially damaging. Exposure to wind, sun, or dry air is another culprit when it comes to dehydration. Chemicals also take their toll in the form of dyes, relaxers, and perms. And something as simple as using the wrong brush or comb can contribute to your hair’s damage. Some of the causes of dry and damaged hair can be lessened or prevented but not all, and not all the time. This is where a weekly DIY hair mask can really save the day and your hair! Because this is such a common problem, we’ve included two recipes, though there are many more you can try. We used egg whites for oily hair but for dry hair you want to use the egg yolk. Eggs are rich in protein, vitamins and fat—perfect for nursing dry hair back to health. Egg yolks nourish, moisturize, and lubricate dry damaged hair. For damaged hair, egg yolk will strengthen hair follicles and roots. A powerhouse for deep conditioning, egg yolk softens hair, revitalizes it, and transforms it back into silky smooth locks. Egg yolks can also prevent hair loss. Whisk the egg yolk in a small mixing bowl until it turns frothy, then add in 1 tablespoon of olive oil and mix well. Using clean fingers, apply the hair mask onto your scalp first. Massage the hair mask into your scalp in a gentle circular motion for about 1 to 2 minutes. Cover your hair with a disposable shower cap/plastic bag. Wait for 15 minutes. When the time is up, rinse your hair thoroughly with cold water. (Do not use hot water or you will cook the egg in your hair). Coconut oil is not only delicious but it’s also full of amazing hair-healing properties. Unlike many store-bought products that simply add a synthetic coating to the strands of your hair, the chemical structure of coconut oil enables the fatty acids to actually penetrate the hair shaft. Your hair will be rejuvenated from the inside out! Coconut oil physically replenishes and adds volume to the hair for long-lasting moisture and shine. Honey and coconut oil work together in perfect harmony. Honey is classified as a natural humectant and emollient, meaning it attracts and retains water molecules. Coconut oil, when added to honey, helps to seal in this action. Honey also contains anti-bacterial enzymes, antioxidants, and minerals that are powerfully nourishing for the hair follicles and scalp. And, once more, the addition of coconut oil helps to deliver these important compounds into the cells where they promote hair growth and strength. Scoop honey and coconut oil into small pan and heat on stove top at low heat until melted, stirring briefly to combine. Allow to cool to the touch, but not enough so that the coconut oil hardens. Apply to wet or dry hair, concentrated on vulnerable areas and ends of the hair. Comb through with your fingers or a wide-toothed comb and massage gently to cover. Let sit for 15-30 minutes. If my hair is healthy, why do I need a hair mask? You may be asking this question and the answer is simple: to keep your hair healthy! Damage can creep up slowly, long before there are any noticeable signs. In addition to a weekly hair mask you may want to look at your diet. Are you getting enough of the vitamins and nutrients that are vital to healthy hair growth? By adding a nutritional supplement such as Hairfinity you could greatly improve your hair over time. .
Yogurt is a good all-around DIY hair mask ingredient for regular maintenance and deep conditioning. Along with other benefits for strong, healthy hair, yogurt can accelerate growth in slow growing hair. The protein content in yogurt provides ample nourishment and strengthening to the hair without making it dull or dry. And yogurt further aids growth by stimulating blood circulation, thanks to its zinc and lactic acid properties. Yogurt also contains anti-fungal and antibacterial properties that help stimulate hair growth by acting as a natural cleanser. And if you happen to be suffering with an itchy scalp thanks to cold weather or dry air, the antibacterial benefits of yogurt for hair also help soothe the scalp and reduce itchiness. Mix egg yolk and yogurt together well. Coat hair with mixture, cover with shower cap, and leave on for 20 minutes. Rinse with cool water. (Do not use hot water or you will cook the egg in your hair). Shampoo and condition as normal. Once you learn the basics of homemade hair mask ingredients, you can experiment with a recipe that’s uniquely suited to your hair. Here are some of the common ingredients and their uses. Do you want Longer, Stronger, Faster Growing Hair? Hairfinity hair vitamins is transforming the hair of women all over the world with a unique blend of vitamins, nutrients, and our exclusive Capilsana™ Complex. Hairfinity users have reported decreased shedding, thicker, healthier hair, and improve manageability and overall appearance.